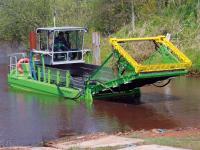 The "6925" is a new product that combines the strengths of an amphibious boat and a weed harvester. 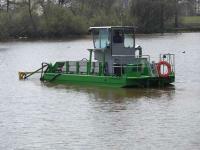 It discharges completely autonomously with its chain drives from the lorry and goes directly into the water. 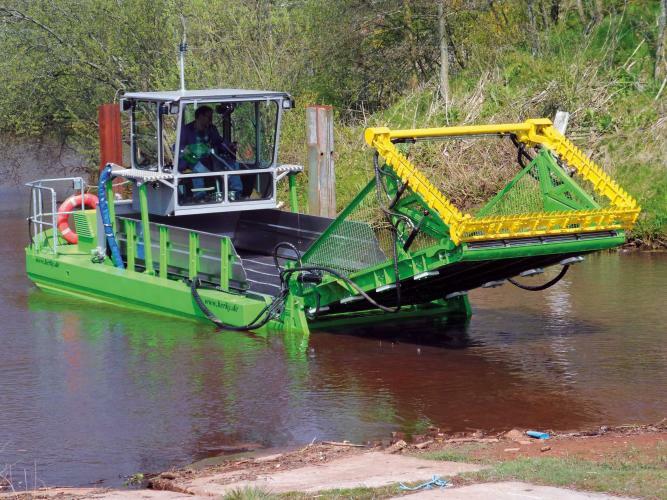 The boat can be used for cutting and collecting water plants, trash, woods and other impurities in shallow waters or swampy areas and it also can be used in areas which are not reached by floating equipment. 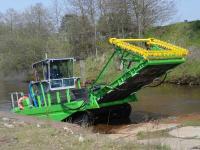 In particular, the front U-shaped-double knife and large loading capacity of up to 15 m³ provide effective drainage and compression of the collected material. The unloading on the shore or on transport boats is possible thanks to the conveyor belts within 30 seconds. Due to the lowerable driver’s cab is even driving through low bridges no problem and it also provides an optimal visibility while working. “Customized serial production” is the motto of Berky. 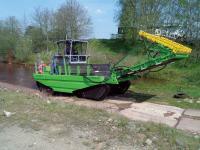 On request, the amphibious weed harvester 6925 can also be stocked by other special equipment, such as an echo sounder.